Don’t write to me about this post. I will permanently block your e-mail address. Another step in the Las Cristinas saga. Someday, son, all this will be yours. Las Cristinas mine site, aerial view, January 2009. Courtesy of BEAM. And no, you shouldn't write him either. TORONTO, ONTARIO–(Marketwire – June 7, 2010) – Crystallex International Corporation (TSX:KRY)(NYSE Amex:KRY) announced today that it has signed a binding agreement (the “Agreement”) with China Railway Resources Group Co. Ltd. (“CRRC”) to create a strategic partnership for the development of the Las Cristinas gold project in Bolivar State, Venezuela (“Las Cristinas”). China Railway Engineering Corporation (“CREC”) is the world’s largest contracting and engineering company and one of the world’s 150 largest companies. It is one of China’s largest state-owned companies with the majority of its shares held by the People’s Republic of China. CRRC and Crystallex have met with the Government of Venezuela to apprise them of this strategic partnership and are very pleased by the Government of Venezuela’s expression of support. Both Crystallex and CRRC are working closely with Venezuelan officials to obtain the approvals and permits required to bring Las Cristinas into production. The advancement of Las Cristinas will benefit all stakeholders and especially the people of Venezuela, particularly in Bolivar State. Under the terms of the Agreement, CRRC is leading the efforts of the strategic partnership to unblock the stalled environmental permitting process for Las Cristinas and will provide the necessary project capital to develop the project to commercial production at an optimized mining rate. Upon completion of the transactions contemplated by the Agreement, Crystallex will hold a one-third fully carried interest in the Las Cristinas Joint Venture and CRRC will have a two-thirds interest. Crystallex will contribute the Las Cristinas Mine Operating Contract, Feasibility Study, all design and engineering already completed by Crystallex and other project assets. CRRC will provide the necessary construction and operating capital to fund project development, optimized expansion and operation and will be responsible for construction of the project. Crystallex will pay for its one-third carried interest of the capital costs provided by CRRC from its share of future cash flows from the project. In addition, CRRC will assist Crystallex to retire the outstanding noteholders’ obligations; will provide a construction guarantee; and has agreed to make an equity investment in Crystallex following closing of the transactions, at a share price based on the then prevailing market price of the common shares of Crystallex. CRRC had previously advanced Crystallex US$2.5 million during the negotiation of this Agreement. Subject to requisite regulatory and shareholder approvals, this US$2.5 million advance is convertible into common shares of Crystallex at a price of Cdn$0.40 per share. CRRC shall also have a onetime option to convert a portion of funds advanced to Crystallex to satisfy its obligation to the noteholders into common shares of Crystallex at a price of Cdn$0.40 per share for a period of five years from the date of funding, provided that CRRC and its affiliates shall beneficially own not more than 19.9% of the outstanding common shares of Crystallex after giving effect to such conversion. CRRC shall have the right to maintain its pro rata equity interest in Crystallex to a maximum of 19.9% of the outstanding shares. The closing of the transactions contemplated by the Agreement is subject to the applicable regulatory, government and shareholder approvals, satisfaction or waiver of all conditions contained in the Agreement and the execution and delivery of all closing documents including final definitive agreements which are being prepared and are expected to be completed before July 30, 2010. A meeting of Crystallex’s shareholders to approve the transactions is expected to be held in August, 2010 with closing expected in the third quarter of 2010. A copy of the Agreement will be filed on http://www.sedar.com within 24 hours of this release. Crystallex’s financial advisors are Macquarie Capital Markets Canada Ltd., GMP Securities L.P. and Kingsway International Holdings Limited and its legal advisors are Cassels Brock & Blackwell LLP. CREC runs a spectrum of businesses covering surveying and designing, construction and installation, manufacturing, R&D, technical consulting, capital management as well as international economic and trade activities. CREC is the largest civil construction enterprise in the world, and the largest Asian and Chinese railway, road and tunnel construction contractor. It has a leading position in China’s construction market, and participates in many large-scale infrastructure projects overseas (especially in countries in Southeast Asia and Africa). CREC is currently constructing a US$7.5 billion railway project in Venezuela linking southwestern Cojedes State and the eastern Anzoategui State. CRRC is the wholly-owned resource subsidiary of CREC with mining projects in Africa, Australia, Central Asia, Ecuador and Panama. Crystallex International Corporation is a Canadian based company, whose principal asset is its interest in the Las Cristinas gold project located in Bolivar State, Venezuela. Crystallex shares trade on TSX (symbol: KRY) and NYSE-Amex (symbol: KRY). Proven and Probable Reserves were estimated at 16.86 million ounces of gold (464 million tonnes with an average gold grade of 1.13g/t) based on a US$550 gold price assumption. The reserve estimate was comprised of 113 million tonnes at a gold grade of 1.24g/t (4.48 million ounces) in Proven Reserves and 351 million tonnes at a grade of 1.10g/t (12.38 million ounces) in Probable Reserves. Measured and Indicated Resources were estimated at 20.76 million ounces (629 million tonnes with an average gold grade of 1.03g/t, which comprises 146 million tonnes at a gold grade of 1.14g/t (5.38 million ounces) in Measured Resources and 483 million tonnes at a grade of 0.99g/t (15.38 million ounces) in Indicated Resources. Inferred Resources, which did not contribute towards the Proven and Probable Reserves, were estimated at 6.28 million ounces (230 million tonnes at an average gold grade of 0.85g/t). For further details of the Reserves and Resources, see Crystallex’s 2009 Annual Information Form filed on SEDAR at http://www.sedar.com. SPECIAL NOTE REGARDING FORWARD-LOOKING STATEMENTS: This press release contains forward-looking statements within the meaning of the United States Private Securities Litigation Reform Act of 1995 and applicable Canadian securities laws, including: statements relating to the expected timing of completion of the transactions contemplated by the Agreement, estimated reserves and resources at Las Cristinas; anticipated results of drilling programs, feasibility studies or other analyses; the potential to increase reserves and expand production, at Las Cristinas; Crystallex’s projected construction and production schedule, and cost and production estimates, for Las Cristinas; and management’s statements regarding its expectations regarding mining in Venezuela. Forward-looking statements are based on estimates and assumptions made by Crystallex in light of its experience and perception of historical trends, current conditions and expected future developments, as well as other factors that Crystallex believes are appropriate in the circumstances. Many factors could cause Crystallex’s actual results, performance or achievements to differ materially from those expressed or implied by the forward looking statements, including: the conditions to the transactions contemplated by the Agreement not being satisfied, gold price volatility; impact of any hedging activities, including margin limits and margin calls; discrepancies between actual and estimated production, between actual and estimated reserves, and between actual and estimated metallurgical recoveries; mining operational risk; regulatory restrictions, including environmental regulatory restrictions and liability; risks of sovereign investment; speculative nature of gold exploration; dilution; competition; loss of key employees; additional funding requirements; and defective title to mineral claims or property. These factors and others that could affect Crystallex’s forward-looking statements are discussed in greater detail in the section entitled “Risk Factors” in Crystallex’s Annual Information Form (which is included in the Annual Report on Form 40-F that Crystallex files with the United States Securities and Exchange Commission (the “SEC”) and elsewhere in documents filed from time to time with the Canadian provincial securities regulators, the SEC and other regulatory authorities. These factors should be considered carefully, and persons reviewing this press release should not place undue reliance on forward-looking statements. Crystallex has no intention and undertakes no obligation to update or revise any forward-looking statements in this press release, except as required by law. To those of you who have never written about Crystallex, sorry for the bitchy tone in the headline. Readers in the mass media understand. Crystallex is one of the many companies that has risen and fallen on the Treasure of the Sierra Madre Las Cristinas gold deposit in Bolivar state, Venezuela. A nice history of the site is here. As a minable resource, Cristinas looks tasty. It’s a mixture of near-surface bedrock and soils that have weathered out of the bedrock. Bolivar state is mostly a swamp, so the highway from Venezuela to Brazil runs along the bedrock, putting Cristinas right by a nice paved road. 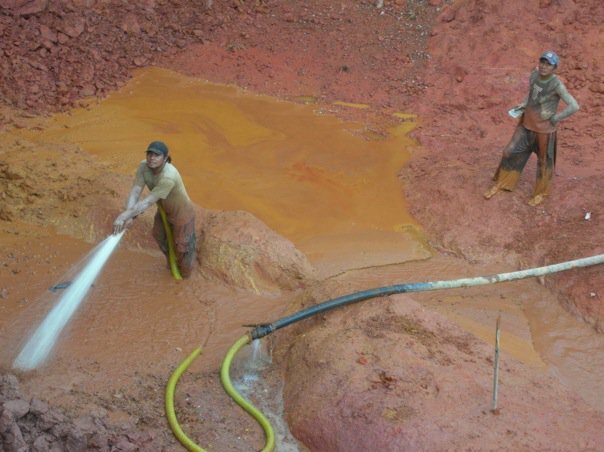 Artesanal miners with hose, Las Cristinas, January 2009. Also courtesy of BEAM. And you still shouldn't write him, call him, text him, stalk him or skype him. Kapiche? 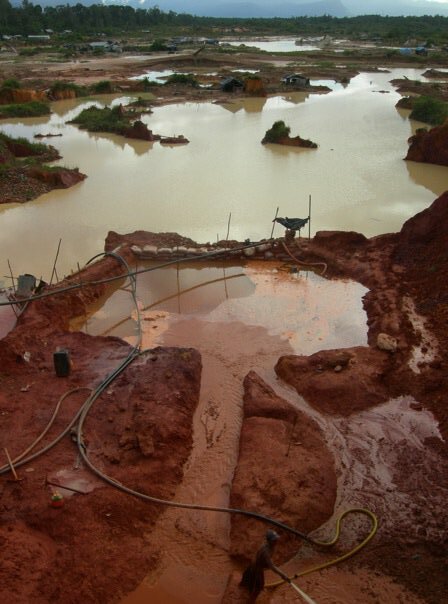 Today, the site is home to anywhere from dozens to hundreds of “artesanal” miners who use bootleg diesel to run big pumps to wash the soils into sluices and pan for gold. They pollute the ground with mercury. Entire families live in plastic-tarp shacks without sewers. They deforest the land to search for new placers, creating a wasteland ripe for malaria transmission. Venezuela’s Central Bank says the majority of the country’s gold is laundered into other countries rather than being sold into the domestic regulated market, and they’d love to get the illegal miners out of there and get their hands on that gold. So you have geology, environment, social justice and politics all lined up. What could possibly go wrong? Oh wait, this is gold. So that should be: you have geology, environment, social justice and politics all lined up. What could possibly go right? Crystallex could have had their mine years ago. It’s not 100% clear what happened, but one theory is that the government never wanted Crystallex and Gold Reserve to split the site and build two mines. The companies weren’t able to agree on terms to combine, so the state never let the permit go through. Another, much simpler, theory is that the companies didn’t grease enough palms. Anyway, Gold Reserve is now in international arbitration. 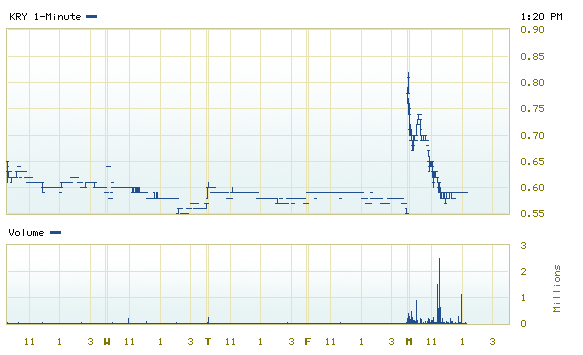 So is Infinito Gold, for their earlier swing-and-a-miss on the mine. And Crystallex is now making the above-mentioned deal, bringing in the well funded Chinese. Regardless of the merits of the deal, this is sure to fire up the Crystallex fan club. Crystallex shareholders are, from what I can tell, susceptible to a group mental illness that combines paranoia, manipulativeness, a sense of victimization and an inability to listen to contrary evidence. That is to say, they are more or less average human beings. But rather than watching Glenn Beck and joining the Tea Party, or setting up an antenna to speak directly to the aliens that the government is hiding from them, they have become obsessed with a stock. Like those who believe Obama is part of a socialist illuminati or those who want to believe in Area 51, Crystallex speculators are always seeking the secret on-the-ground information from reporters. And bloggers, and risk analysts, and just about anyone else who dares to mention this stock. If you so much as fart in the direction of Yahoo’s KRY message board, you are doomed to receive e-mails that will on the one hand embarrass you for your species and on the other hand, perhaps, pull at your heartstrings — there are people who say they got in on the original pump and dump scheme and who continue to hold, hoping to get rich quick, albeit slowly. Most of the e-mails request more information. Some will talk like co-conspirators, because they just know that the MainStreamMedia is hiding something from them. Others will just beg for on-the-ground intel, as if people Caracas (or New York) knew or cared about the day to day gossip out of Clarines Las Claritas, Venezuela. Good luck folks. Count me surprised if a legally mined ounce comes out of Las Cristinas this decade. Humanity is really, really depressing sometimes. KRY 5-day chart, 1-minute candles, courtesy of TSX. This entry was posted in Uncategorized on June 7, 2010 by Steven Bodzin.